If your business or organization has its own Facebook Page, Direct Mail makes it easy to add a subscribe form that looks great, syncs automatically with Direct Mail, and doesn’t require your visitors to leave Facebook to sign up! Here’s how to add a subscribe form to your Facebook Page. First, you’ll need to make sure your business or organization already has a Facebook Page. If you don’t already have one, click here to build one. 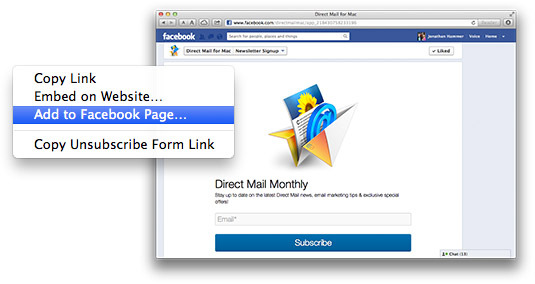 Once your Facebook Page is built and working, switch back to Direct Mail. Click on the Addresses tab at the top of the window and select the address group (from the list on the left) that you want your subscribe form to sync with. If you haven’t already, you’ll need to create a subscribe form for that group. That’s it! Facebook will confirm that you want to add the subscribe form to your Facebook Page. In Facebook terms, the subscribe form is an “app” that you add to your page. Once it’s added, visitors to your Facebook Page will see a “Newsletter Signup” app icon at the top of your Page (next to the Photos, Likes, and any other app you’ve installed on your Facebook Page). If you want to see an example of what the finished product looks like, head on over to our Facebook Page and click the Newsletter Signup tab at the top of the page. Questions? Don’t hesitate to get in touch with our support team. Thanks for reading!